A rule is a set of criteria and automatic actions that will be applied to new messages as they arrive in your mailbox. Your email program will first check to see if a new message meets the conditions you have specified, then it will perform an action such as move it to a folder. Rules can be used to manage your email by automatically organizing messages into folders as they arrive. 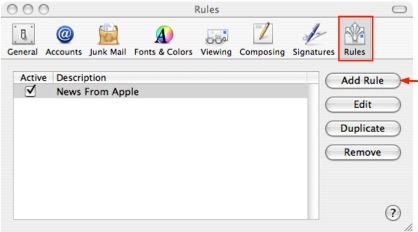 Choose Mail, Preferences and click Rules. Click Add Rule and type a descriptive name for the rule. Set the conditions necessary for the rule to apply to a message. Choose actions to perform on messages that meet the conditions. To specify multiple criteria and actions, click the Add (+) button. If you have multiple rules, they’re applied in the order in which they appear in the Rules list. Drag a rule in the list to change its order. The rule will be applied to all future messages you receive. 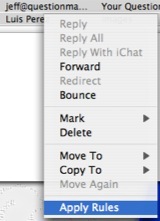 To apply the rule to messages already in your mailbox, first select them (you can use the Command + A shortcut) then right-click and select Apply Rules.